I read The Catcher in the Rye, the major work by J.D. Salinger, and was not overly impressed. It's a brilliant, well-written book, but it was not for me because I am well past my angst years. Truth be told, I don't think I had any actual angst years. Salinger, our lovable cantankerous recluse, refused to ever sell the film rights to The Catcher in the Rye and spent his decades post-Catcher refusing interviews and writing but not publishing. We had to wait seven years after his death to get a biopic, Rebel in the Rye. Salinger, I'm told, loved movies. 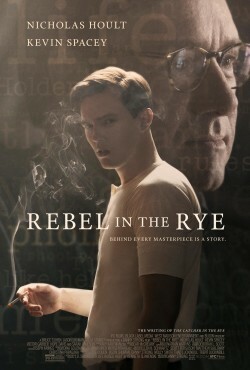 He certainly would not have loved Rebel in the Rye save for being played by the extremely handsome Nicholas Hoult. In 1939, Jerome David Salinger (Hoult) yearns to be a writer of note. He certainly does not yearn to be a 'bacon king' and follow in his father Sol's (Victor Garber) footsteps in business. Jerome has his eyes on a pretty young thing named Oona O'Neil (Zoey Deutch), daughter of legendary playwright Eugene. He manages to squire her around town, but he also is a bit hesitant to succumb to her charms. He manages to get into Columbia University, where he finds a mentor in Whit Burnett (Kevin Spacey), a writing instructor who also edits Story Magazine. Our cocky, cocksure Jerome keeps pushing to be published and arrive, while Whit keeps shaping him to write with his own authentic voice. One short story particularly impresses Whit: A Slight Rebellion Off Madison, as does the main character, one Holden Caulfield, whom Whit pushes Jerome to write a whole novel for. Then comes The War, and Jerome goes off to Britain to fight. Here, two major events in Jerome's life occur: he learns that Oona has not waited for him but married Charlie Chaplin, and he participates in both D-Day and the liberation of concentration camps. Jerome returns, emotionally battered and with a new wife he quickly disposes of. He also continues to write, but finds himself struggling. It is only through meeting a Buddhist guru that Salinger starts finding another way, and he punches out The Catcher in the Rye. He finds the idea of publishing and the press/public attention to his work very bothersome. He becomes more metaphysical, marries again and soon starts withdrawing from everyone and everything. He breaks off relationships left right and center and eventually turns total recluse. I find that Rebel in the Rye is hardly rebellious. In fact, writer/director Danny Strong's film is quite standard in telling this part of Salinger's life story. We get the standard 'he finds bits that will eventually find his way into his Opus' details. There's the opening scene, where Salinger complains about the 'flits and phonies' he meets at a club. There's when after getting beat up by robbers, he finds himself in front of a carousel, watching the children in delight. We get those words of wisdom from the mentors, ranging from Whit's advise of "imagine a book that you want to read, and then write it" to Salinger's guru own metaphysical insights. We see lots of scenes of him writing out at his typewriter or on his notebook, with his loving mother cheering him on while his disapproving father and sister don't. In many ways, Rebel in the Rye is quite square. Not that there is much wrong with that, as I believe that it is hip to be square. It is just that Salinger still remains highly opaque, physically there but emotionally or spiritually absent. A lot of Rebel in the Rye felt rushed, where we were hitting a few highlights on our way to this inevitable masterpiece of American literature. The love story between O'Neill and Salinger was underdeveloped to where when he reads that she married Chaplin, there is no impact on the viewer. Same when Salinger breaks off his relationship with Whit. From the film, this split comes from Whit's inability to get an anthology published. Salinger thinks it was deliberate, Whit insists he fought hard and simply could not do it. I'm thinking it was somewhere in between, but Rebel in the Rye isn't convincing for either version. It also does not show how Salinger was becoming either more eccentric or more arrogant, such as in his refusal to have the manuscript published for others to read. This led to a good moment in the film, when the publisher went up to our crabby literary genius and asked if he wanted a publisher or a printer, for if he wanted the latter, he could go and do that himself. It's the only time where someone stood up to Salinger, and the only time Salinger gave in to someone else. Perhaps apart from being too handsome to be a realistic Jerome David Salinger, Hoult was one of the positives in Rebel in the Rye. He's become an extremely reliable actor who can elevate the material, at least as much as he can. I cannot fault Hoult for not making Salinger into someone I could either relate to or understand, or in those awful voiceovers that are the bane of my cinematic experiences. Spacey, in perhaps one of his final films before his shocking downfall, shows us his talent, making Whit's evolution from the cynical mentor to desperate supplicant a strong performance. If there is a great flaw in Rebel in the Rye, it is that so many other important figures, such as O'Neill or Claire Douglas (Lucy Boynton), his second wife, pop in and out so quickly you don't get what the connection was between them. As an insight into this most mysterious and crabby of literary giants, Rebel in the Rye does not give us much. It is not a bad film, with respectable performances and a great fondness of jazz music. I could never accuse Rebel in the Rye of being a phony, because it was not very sincere to begin with.